Synthetic biopolymers are polymers that are modified from natural polymers or chemically synthesized from synthetic monomers in such a way that they can undergo natural degradation, without leaving any residues that are harmful to the living and natural environments. Over the last few years, synthetic biopolymers have attracted much attention, because of their distinct advantages over natural polymers in terms of stability and flexibility to suit a variety of applications. On the other hand, synthetic biopolymers are favored over synthetic polymers because of their biodegradable properties and their innocence to the environment. Thanks to the advancements made in new molecular designing tools and polymer chemistry, the synthesis of synthetic biopolymers can now be tailored to fit their specific applications. Synthetic biopolymers have found one of its most important applications in the medical field because of some of their unique properties such as stability, controlled release, nonimmunogenicity, and clearance from the body, which suits their application in human bodies. 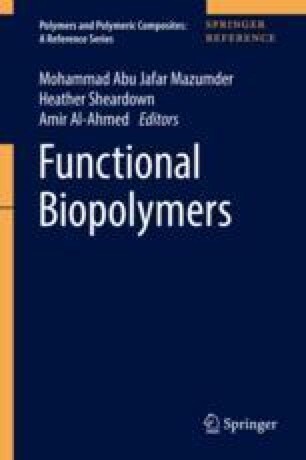 The current chapter reviews the synthesis, biodegradation, application, and commercial production of synthetic biopolymers, based on most recent literature, with a special focus on biomedical applications.